Animal-based diets play a major role in climate change and in the mass die-off of species. Animal products provide the common denominator. 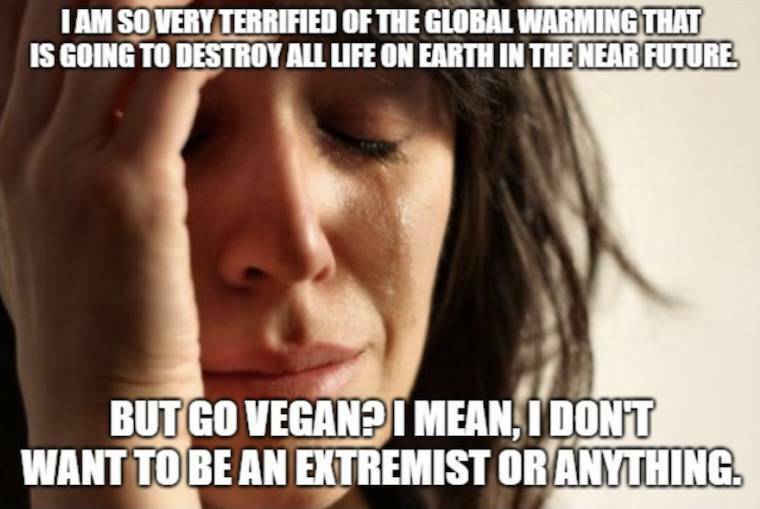 To not promote a vegan diet as the central focus of environmental activism makes no sense whatsoever. It is becoming clear that we are facing an imminent climate catastrophe. The United Nations says that we’ve got about 12 years left to avert that catastrophe which, in case you haven’t noticed, is already rearing its ugly and deadly head. It is time for the Green Party, Extinction Rebellion, and anyone else concerned about averting that catastrophe (shouldn’t that be everyone?) to stop ignoring the elephant in the room: a massive transition to a vegan diet is necessary for us to survive. Let me say upfront that I have been a vegan for 36 years because I believe that we cannot justify exploiting animals for food, clothing, or other reasons. So I believe that veganism is necessary for moral purposes. In this essay, I want to argue that a vegan diet is necessary for ecological reasons as well. We have known for a while that animal agriculture is ecologically very unsound. There is no question that animal foods represent an inefficient use of plant protein in that animals have to consume many pounds of grain or forage to produce one pound of meat. For example, in 2003, Cornell University Professors David Pimentel and Marcia Pimentel showed that it takes 13 kilograms (a kilogram is 2.2 pounds) of grain and 30 kilograms of forage to produce one kilogram of beef; 21 kilograms of grain and 30 kilograms of forage to produce a kilogram of lamb; 5.9 kilograms of grain to produce a kilogram of pork; 3.8 kilograms of grain to produce a kilogram of turkey; 2.3 kilograms of grain to produce a kilogram of chicken, and 11 kilograms of grain to produce one kilogram of eggs. Livestock in the United States consume 7 times as much grain as is consumed by the entire U.S. human population and the grains fed to U.S. livestock could feed 840 million humans who had a plant-based diet. Likewise, animal agriculture involves an inefficient use of water. The Pimentel study states that one kilogram of animal protein requires about 100 times more water than does 1 kilogram of grain protein. According to another, more recent study, one kilogram of beef requires 15,415 liters of water (a gallon is 3.78 liters); sheep meat (lamb and mutton) 10,412 liters; pork 5,988 liters; and chicken 4,325 liters. A kilogram of apples requires 822 liters of water; bananas 790 liters; cabbage 237 liters; tomatoes 214 liters; potatoes 287 liters; and rice 2,497 liters. Most estimates vary between 1,000 to 2,000 gallons of water needed to produce a gallon of milk. 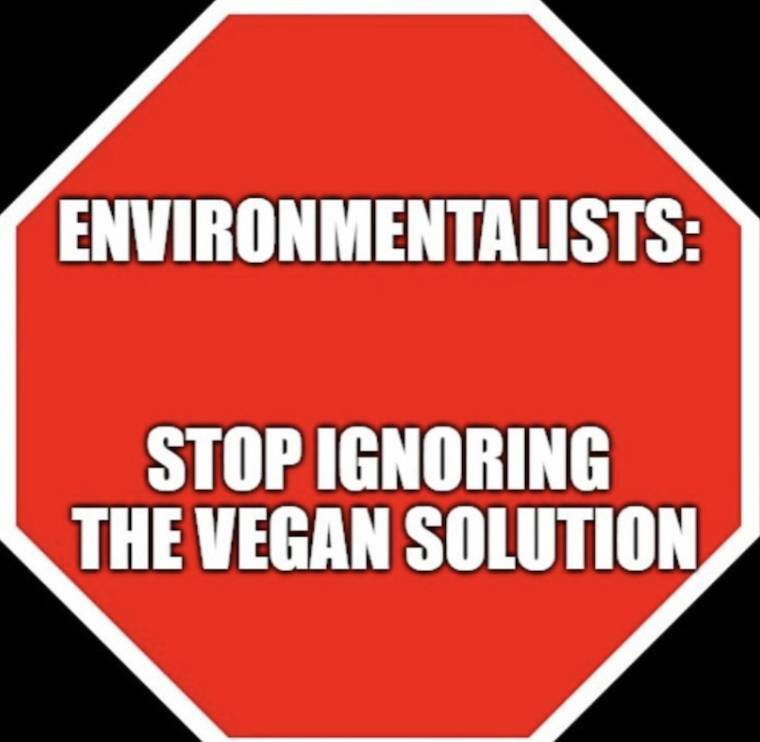 If I had a penny for every environmentalist who told me that they weren’t vegan but they did not fly, or they had an electric car, I’d have tons of pennies. One would think that, in light of all of this, serious environmentalists would be campaigning for everyone to adopt a vegan diet. One would be mistaken. The environmental movement has not promoted veganism. It has, instead, focused attention on factory farms and has promoted a whole new industry of “sustainable,” “local,” and “free-range” products. Factory farms are, indeed, an environmental nightmare for a number of reasons. But the “sustainability” approach is nonsense. Putting aside that the animals who are killed for human consumption might regard “sustainability” in a jaundiced way, from an ecological point of view, it solves nothing. “Sustainable” grazing animals may consume less grain but they drink more water because they are more active; they still produce methane gas; and they require more grazing land. Locally produced animal products have a much greater environmental impact than plants that have been grown somewhere else. According to a study in Environmental Science and Technology, transportation accounts for only 11% of the carbon footprint of food with 83% attributable to production. So the idea that you’re doing more for the environment by eating animal products produced locally than vegetables transported in is just wrong. In sum: “sustainable” animal agriculture will not—cannot—save the planet. The environmental movement also supports a “reducetarian” approach. Greenpeace calls for a 50% reduction of meat and dairy by 2050. Sorry—that’s way too little way too late. A reducetarian approach will not be sufficient. Any reduction that is going to be meaningful from an environmental perspective is going to have to be “huge” and represent something much more approximating complete elimination. That is, “Meatless Monday,” “Vegan Before 6,” and a general and vague “reducetarian” directive are not going to cut it. The idea that “every little bit less consumption is a good thing” might be a plausible way of looking things if we had another 100 years to address the problem of global warming. We don’t. And preliminary data suggest that reducetarians do not seem to reduce too much. Some claim that we can couple reduction with other technologies so as to avoid the necessity of going vegan. Yes, we might couple significant reduction of consumption with other technologies but, again, we simply don’t have the time to develop those technologies and even if all of the technologies are available now, we do not have the time to work out what combinations of strategies will work, and what numbers of people are required to participate in what strategies to achieve what could be achieved if there was a massive shift to a vegan diet. Moreover, even if a severe reduction in consumption were to be sufficient, we know that not everyone will participate in that severe reduction. Therefore, those of us who completely eliminate animal products are helping to deal with the deficit caused by the non-participation of others in that severe reduction. How about those radical Extinction Rebellion folks? They’re willing to get arrested for the planet. Surely, they’re willing to go vegan and to promote veganism? Apparently not. I went to the Extinction Rebellion website and spent about 30 minutes reading it. I found much of it pretty vague in terms of what concrete things it is advocating that people do other to attend ER events and to make demands of government to be transparent about climate change, act to deal with carbon emissions, and provide citizen oversight. Forgive me, but I am a tad skeptical that these laudable political goals are going to be recognized much less achieve success in the near future and certainly not in time to avert catastrophe. I found nothing on the ER website about the necessity of veganism. Indeed, I was unable to find any mention of veganism on the site. I have seen comments from ER people to the effect that ER is deliberately not focusing on individual action but only on collective demands directed toward the government. This reflects the “personal/political” distinction that I thought we all recognized as illusionary a few decades back. Apparently not. The personal is the political. The idea that we don’t see as relevant our own obligation to do the most effective thing that we can do as individuals because that supposedly isn’t political is beyond absurd, and is a transparent way to let ourselves off the hook while we go out and have a good time at a demonstration or student strike. Moreover, even if we assume that the government will respond favorably and will do so before it’s too late, it makes no sense to say that we should pursue a strategy that has a very small chance of prevailing while ignoring a strategy that could work if we aggressively an unequivocally promoted it. Unfortunately, ER appears to be more about appearing to be radical than being radical. I have also seen comments from some prominent ER people to the effect that ER does not want to judge anyone’s lifestyle or tell people what to do. But that makes no sense. It’s analogous to a doctor saying that the doctor isn’t willing to tell you to stop smoking because the doctor does not want to judge your lifestyle or tell you what to do. It’s not a matter of making judgments or giving normative directives. It is a matter of what one ought to do if one wants to maximize the chances of surviving. The bottom line is clear: we are facing imminent disaster. Adopting a vegan diet is the one thing we can do right now. It does not involve any technological innovation. It does not involve any legislation or government regulation. If we really want to save the planet from climate catastrophe, we must promote a grassroots effort with a clear normative directive: stop eating animal products and adopt a vegan diet. We need to see adoption of a vegan diet as necessary. It may not be sufficient—we may have to do other things to reduce our impact on the planet, but adopting a vegan diet is, as a practical matter, necessary given the imminence of disaster. Will those who adopt a vegan diet for ecological reasons “cheat”? Yes, probably. But from an environmental point of view, consuming animal products ought to be considered as something that one does, if at all, as “cheating,” rather than patting oneself on the back because one has consumed just dairy, eggs, and fish on Meatless Monday. I am not saying that we ought not to engage in political action as well as promote a grassroots vegan movement. I am, however, skeptical to the point of incredulity that government will provide a timely solution. 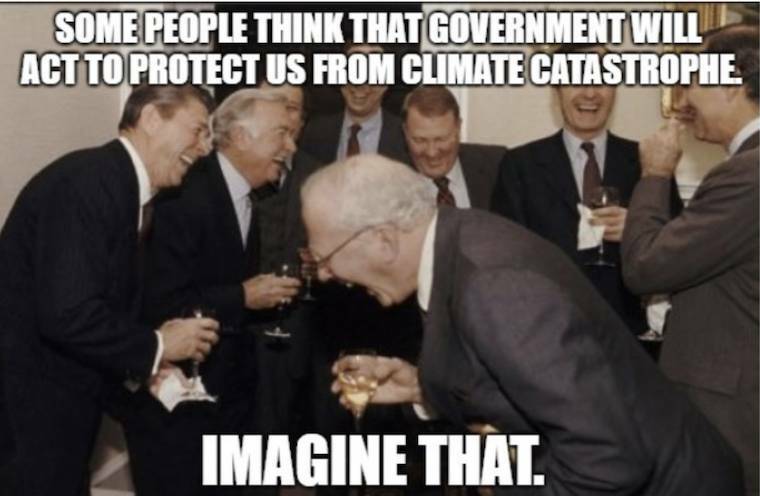 Government will act, if at all, only when it’s too late. I do think that political action has a symbolic value and it helps to educate people, but it is clear that an environmental movement that raises the alarm about global warming and does not aggressively and unequivocally promote a vegan diet is just engaging in hollow rhetoric and grandstanding. Animal-based diets play a major role in climate change and in the mass die-off of species. Animal products provide the common denominator. 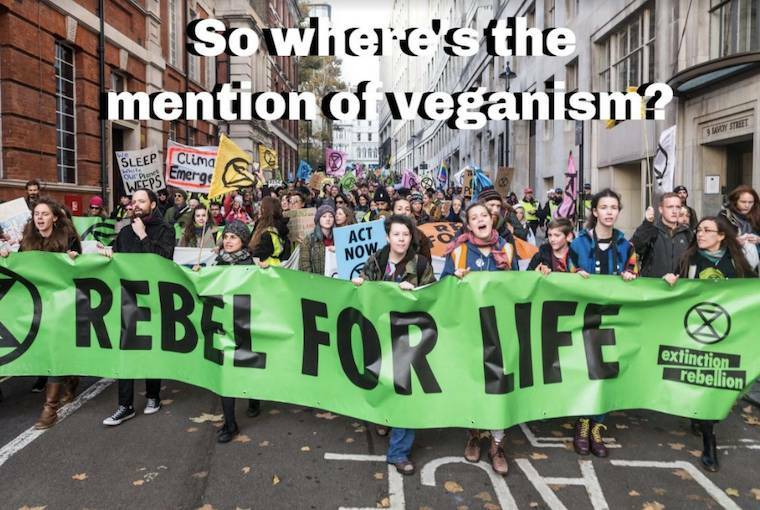 To not promote a vegan diet as the central focus of environmental activism makes no sense whatsoever. The time is short. The consequences are catastrophic. We need to act. Now.